Three years ago today, on December 27, 2008, the Israeli Defense Force launched Operation Cast Lead in Gaza. The offensive left a trail of death and destruction in its wake, including hundreds dead, thousands displaced, and nearly the entire 1.5 million-person population traumatized and hungry. In the years since the bombing stopped and tanks rolled through agricultural fields, recovery has been slow. Even so, Gazans remain steadfast in their determination to rebuild their homes and lives, despite the ongoing Israeli-imposed siege, which will approach its fifth year in 2012. The siege painstakingly circumscribes what can be brought in and out of Gaza, and keeps potential dual-use goods to a trickle. Dual-use goods are materials that can be used for both civilian and military purposes and includes basics such as building materials, cooking gas and petrol. While the Israeli government claims it limits imports of these goods into Gaza because of security concerns, in reality these restrictions impose extreme hardship on the everyday lives of families in Gaza. Although international organizations such as the United Nations Development Programme, the United Nations Relief and Works Agency, USAID, etc., can now import limited quantities of construction materials into Gaza, there remains a chasm between what they can import and what is needed to rebuild Gaza. The siege also means Gazans are a captive population with limited mobility. The majority of Gazans cannot leave the strip to visit family or access medical services; and very few non-Gazans can enter. In response to vigorous condemnation by humanitarian activists for this collective punishment, the Israeli government claims to have eased the siege by allowing more goods to enter Gaza. In reality, the Israeli-controlled crossings are closed more often than not and goods cannot reach Gaza via its heavily patrolled coast. The siege restricts farmers’ access to their agricultural land as well as curtails Gazans’ use of maritime waters by squeezing them between ever encroaching buffer zones. In 2011, Gazans lost their legally approved fishing space when Israel further restricted fishers catch to within three nautical miles off the coast of Gaza. In contrast, the Israeli government agreed that fishers would have access to twenty nautical miles when it signed the 1995 Interim Agreement with the PLO. This new limit represents a significant loss of income for fisher families, and creates devastating barriers to food sovereignty for their broader communities. Restricted access to farmland and maritime waters has led to a precipitous decline in the population’s nutritional and material welfare at a time when domestic production of food is vital. According to B’Tselem, the Israeli Information Center for Human Rights in the Occupied Territories, the siege has led to 40% unemployment rate and, correspondingly, over 50% of the population now lives in poverty. Despite these realities, Gazans have been slowly rebuilding their lives with the help of local, grassroots organizations, including Grassroots International partners. 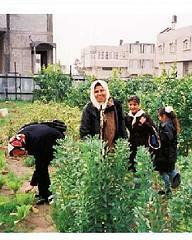 For example, shortly after Cast Lead ended the Palestinian Agricultural Relief Committees (PARC) began rehabilitating urban gardens bombed or deliberately damaged by Israeli tanks during the operation and expanding the number of gardens in the strip. Before Cast Lead, these urban gardens had served as a lifeline for Gazan families with limited access to fresh fruit and vegetables. PARC has reestablished hundreds of gardens and implemented new programs to train and support families starting gardens. Based on PARC’s success, the urban garden model is now being replicated by other agencies throughout Gaza and the West Bank, thereby working with many more families towards the goal of food sovereignty. Another local organization and Grassroots International partner, the Union of Agricultural Workers Committees (UAWC) empowers women through collectives, leadership and skills training, and small project management. UAWC’s activities advance women’s participation in Gaza’s formal economy, while highlighting the importance of women’s economic contribution in household economies. Meanwhile, the Gaza Community Mental Health Programme continues to educate, diagnose and treat post-traumatic stress disorder (PTSD), an illness which is rampant in the Gazan population as a result of Cast Lead and years of bombing. With proper diagnosis and treatment, Gazans who suffer from PTSD, including many children, are re-integrated into family life and society. These organizations’ work is buttressed by the Palestinian Center for Human Rights (PCHR), which advocates for the rule of law in the occupied territories, respect and defense of human rights, and accountability when human rights and international law violations occur. PCHR is a partner of Grassroots International and a global leader in documenting and working to address human rights abuses. Unlike some conventional wars – which often also disproportionately affect civilians – the aftermath of Operation Cast Lead has not ushered in a promise of reconstruction or a return to normal in Gaza. Still under siege, normal is a long way off, but Gazans are finding ways to survive and recover, garden by garden and hope by hope.